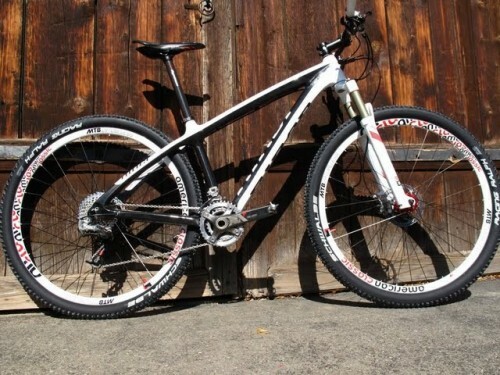 Here we have the Intense Tracer 29″er we got a sneak peek of a few days ago with the production hydro-formed top tube. The green color was retained for this example and we like it. 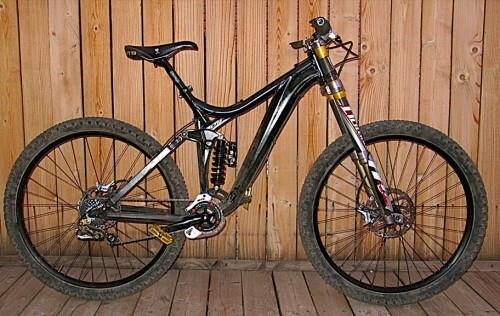 Kona’s 2010 Unit. With a sweet dark metallic green paint job, and very subtle graphics, this bike will belie it’s “caffeinated” nature. The spec sheet lists head tube angles either side of 73 degrees depending on size and a 45mm fork offset on the rigid, steel P2 fork. We’ve had the new Santa Cruz Tall Boy on the site before. 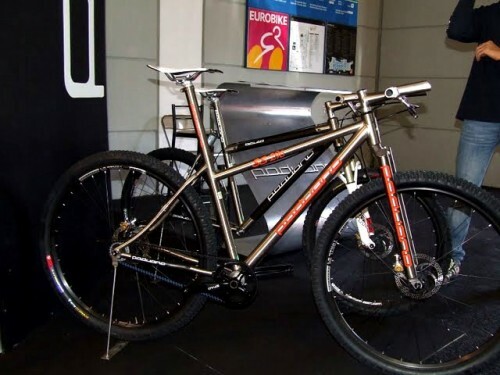 Eurobike was the official “coming out party” for this rig. 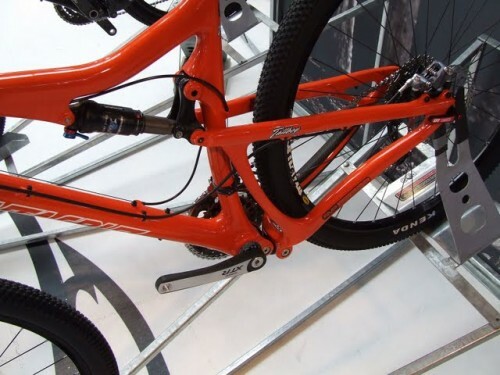 Here’s a look at the sano rear triangle. This bike complete is over the 5K barrier, but we’re willing to bet the first run of these will be gone rather quickly. Can you say “titanium”? 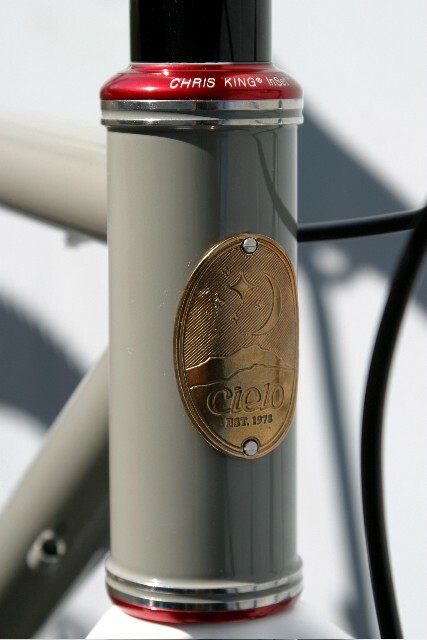 This rig, under the brand name “Paduano”, an Italian maker, was shown with just about everything titanium you can imagine. Integrated seat mast, stem, bar ends, handle bar, fork, and with the addition of a belt drive, it should make for a very, very light bike. Paduano also makes a bike similar to the one in the backround with 29″er wheels that is a combination of titanium and carbon fiber. 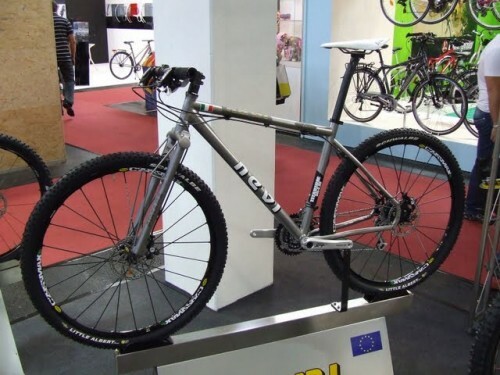 Another Italian marque, Nevi, who have shown 29″ers before at Eurobike, return with this titanium example. A titanium fork with an integrated brace, apparently in an effort to intercept twisting forces, has a segmented crown. The rear modular drop outs are said to be movable to accommodate the swap to 26 inch wheels if desired. 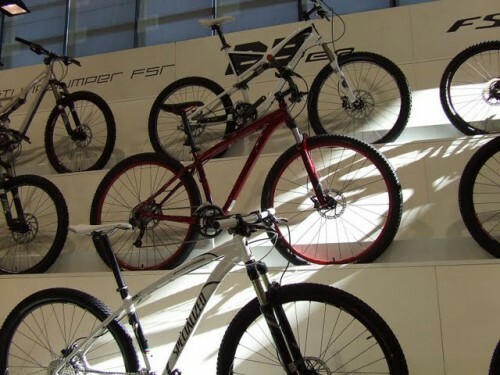 Specialized, who brought an enormous display to Eurobike, had their full line up of 2010 29″ers on display. 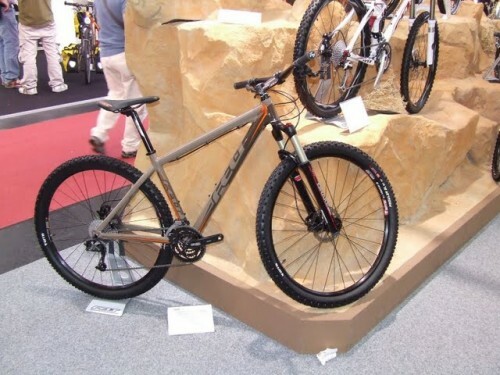 The Felt Nine Comp is a mostly SRAM mix of X-5/X-7 and features a Manitou Drake suspension fork for a MSRP of 1199.99. While many just can not wrap their heads around 36 inch wheels, and think the whole idea is silly, it just doesn’t seem to go away. 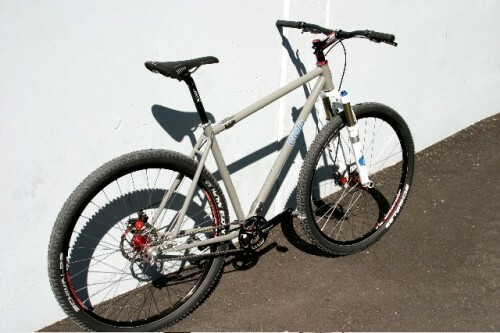 Case in point: This sano titanium 36″er from Kaos Custom Bikes from down under in Australia. The tyres are Nightriders from Unicycle.com as are the Stealth rims. from a Sram cassette. 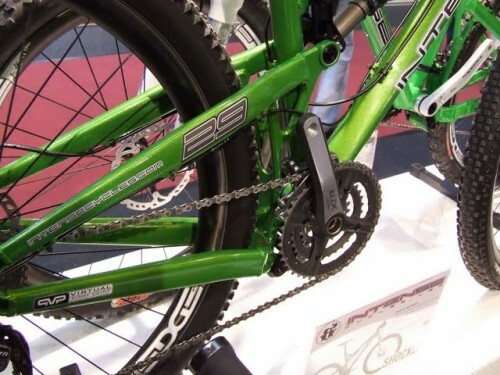 The group set is SRAM Select with the 2 smallest rings fitted on the front. Brakes are the new Avid Elixer 5 fitted to Hope rotors. The rotors are 183mm from M4 down hill brakes. All the tubes in the frame are Straight gauge .9mm wall. Andy claims the bike rides like a dream on the rear wheel. Like most 36″ers, there is a bit of flex going on. 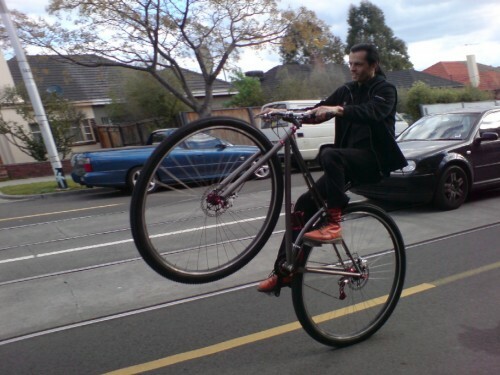 Andy concurs with this saying, “It is a bit flexy when out of the saddle but fine when seated or on the back wheel. Rides great on the back wheel.” Andy also chimes in with what probably is the number one attribute of riding a 36″er- you get noticed- a lot! Andy says, “For the moment it is really great fun and turns heads big time. Its one of those “mobile phone salute” bikes.” Andy also tells us to look for more on the Kaos Custom Bikes site soon on the 36″er. Interesting to note that this one has tubeless wheels which I would imagine ups the roll ability of the 36″er dramatically. 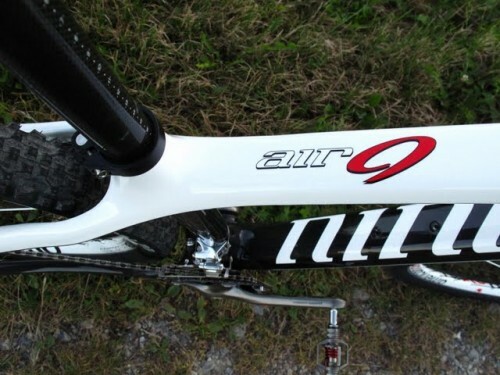 I have only ridden tubed 36″ers and they can be a chore to get going in part due to the rolling resistance of the tire/tube combination and the weight. Getting 600 grams out of the tires has to help a bit! Andy tells us this won’t be the last one that Kaos Custom Bikes does either saying, “This is the first one and the next will likely have 1.5mm tubes all round and some other detail changes. Its been a long time since I built my first uni wheel and got the idea.” We’ll have to wait to see more, but I wouldn’t be surprised to see someone else pushing the limits of 36″er technology soon. There just seems to be something there that grabs the imagination of some folks. Whatever it is, it is fun to check out. Here are a couple of interesting tidbits. One from Eurobike, one from the good ol’ U.S. of A. This pic is making its way around the net as I write this. 4.75″ to 5.75″ of adjustable rear travel is the buzz. 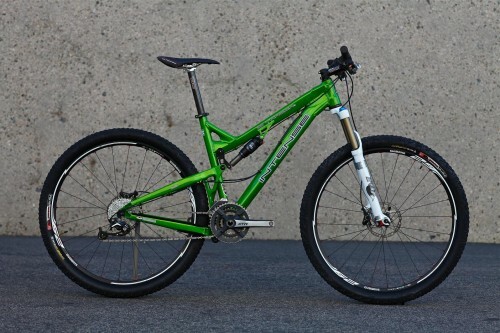 It will be interesting to see how they tweaked the much debated front end geometry that the old Spider 29er had. I imagine this will be quite a bit slacker and I would bet they stiffened up the rear triangle on this one as well. I’ll add that for the uninitiated, the “much debated front end geometry” was the very steep 73 degree head angle. Jeff Steber, owner of Intense, said back in the day when they were developing the Spyder 29″er, that he wanted it to handle like his 26″er did. Well, at that time the offset on suspension forks was locked in at 38mm. Now with that figure more in the range of 44 to 46mm, it is obvious that Intense will need to accommodate for the new fork offsets. I fully expect the head angle on the Tracer to be relaxed by at least two degrees, but time will tell. For more info see Soul Cycles. 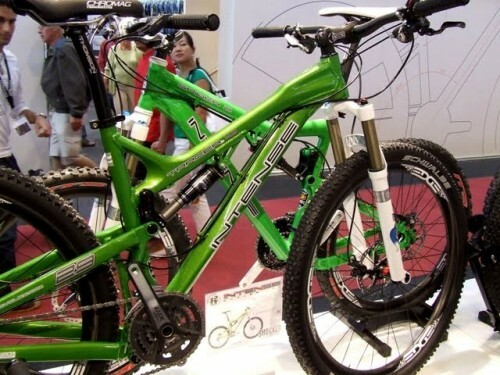 Eurobike, the huge industry trade show held in Friedrichshafen, Germany, has news related to 29″er freaks to chew on. Let’s take a look at what is the scuttlebut from across the pond. Most of which is tire related, by the way…..
WTB Tires: We are hearing that the WTB WeirWolf LT will be joined by a “full tread” version of that model in a 29 inch size for 2010. The 26″er model has been completely revamped, but there is no confirmation at this time that the 29 inch version will be like the newer 26″er one. 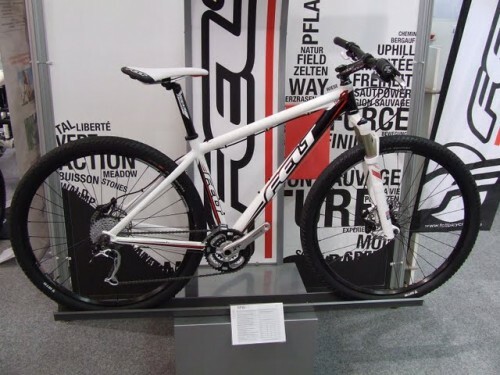 We are also expecting WTB to be releasing the 29 inch version of the Wolverine, but we have not seen any mention of this in any of the Eurobike coverage as yet. Commuter Tire: WTB also has an urban line under the name “Freedom Bicycle“. This line carries products that are designed by WTB but geared more towards urban and utility cyclists. 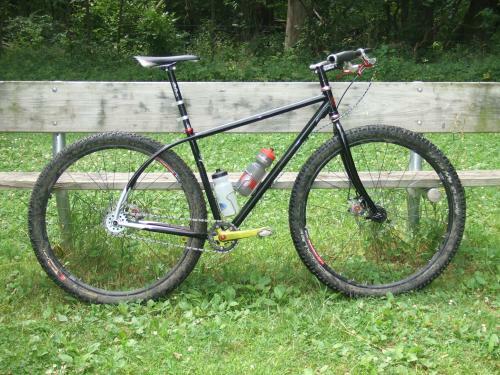 This line has a commuter 29″er tire called the “Cruz Tire” which is offered in three levels. The top of the line model has a reflective strip, “Urban Armor Casing” and a wire bead. The next tier does away with the reflective strip, and the entry level is a plain wire bead model without the “Urban Armor”. 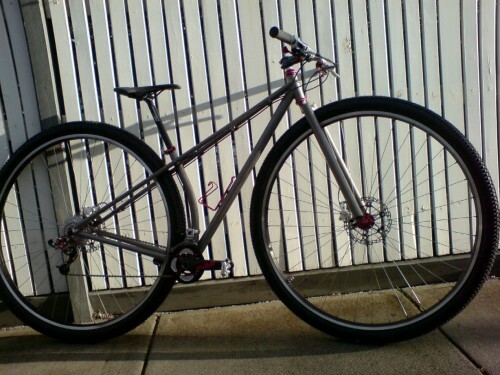 Freedom Bicycle’s Cruz Tire which comes in a 29 X 2.0 size. Michelin: Michelin, which has long been rumored to have had another model of 29″er tire in development, finally revealed it at Eurobike. Based on its former “Dry” XC tire, but renamed the “Wild Race’r”, the tire will be a 2.1″er labled tire. No word on whether it would be tubeless ready or not, although this was initially rumored to be the case at one time. 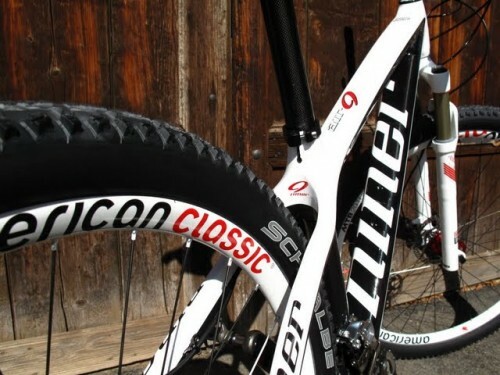 The currently offered “XC AT” will now be known as the “Wild Grip’r” but there is no word on whether or not it will get the beefier side knobs Michelin is now putting on the 26″er Wild Grip’r. Stan’s NoTubes Announces New 29″er Rim: Stan’s has revamped much of its XC rim line up including a refreshing of the 355 ZTR. The new model, dubbed the “ZTR Summit”, will be a slightly wider rim at the inside at 21mm with an overall width of 24mm. The weight is reported to be a bit lighter at 340 grams. Slightly shorter sidewalls and the slight increase in the rim well width is said to “stabilize tires as well as most 30mm rims.” The 29″er size of the ZTR Summit will only be available as a 32 hole drilling per Stan’s literature. More news as we get it. 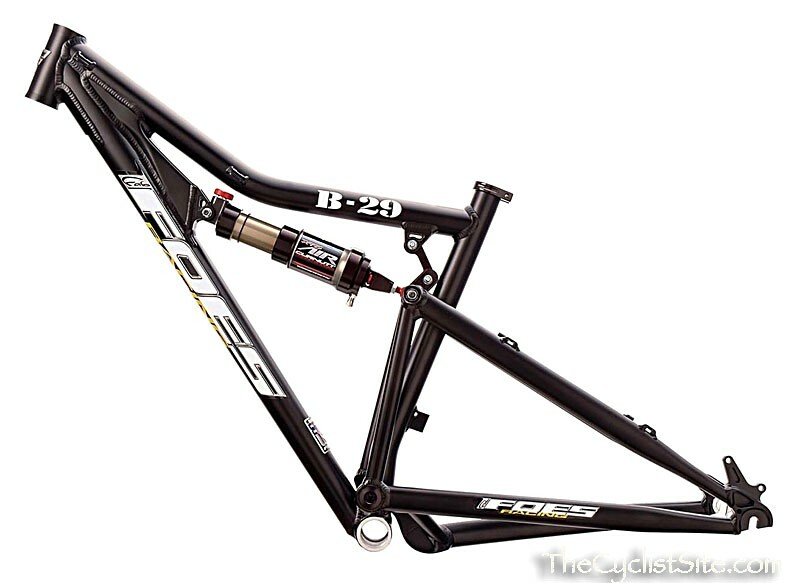 Stay tuned……..
29"er DH: The Final Frontier? 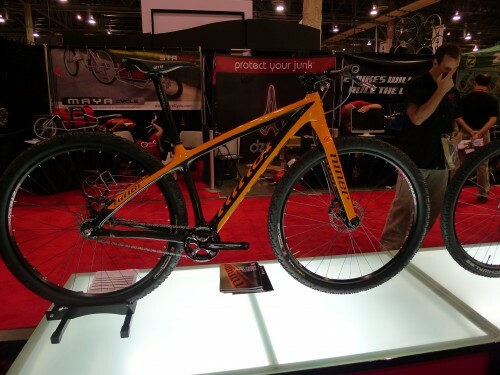 Despite the many views purporting that 29″ers are not going to make a good down hill oriented rig, (And I have held that view myself), there are some who are willing to push the envelope of what is possible with the wagon wheels. Of course, it isn’t as easy as one might think. 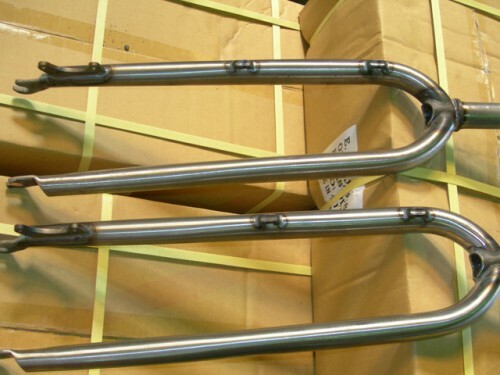 Frame design has to be very carefully engineered to keep the wheel base, bottom bracket, handle bar height, and chain stay lengths within reason. Not only that, but there needs to be components to match, such as tires, rims, and forks. 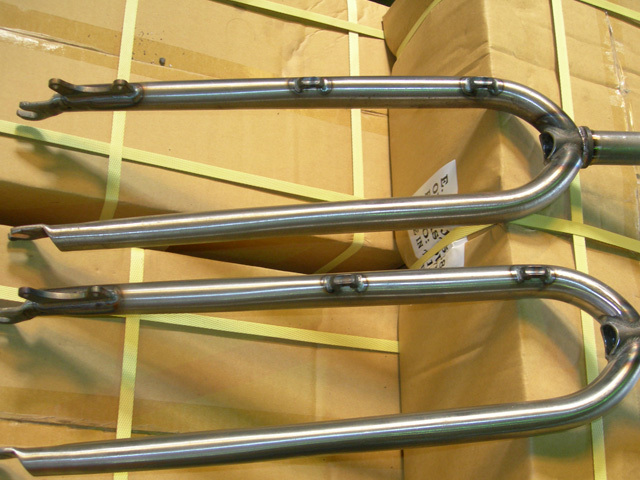 * 175mm travel on both ends. * 6 speed, 13-28 cassette. So far the feedback has been very positive, but there are still some challenges ahead. If things get sorted on this front, it may well be the “final frontier” for 29″er bikes and will certainly be a surprise to those who for years said “it can’t be done”. Interesting times for big wheeled fans, to be sure! 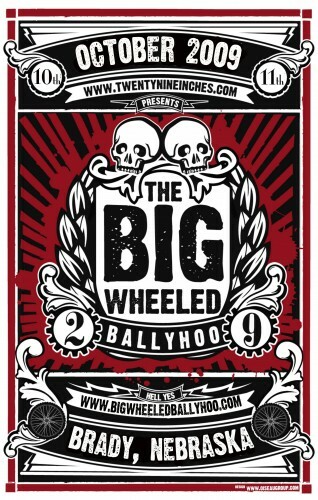 I was happy to get out and check over the site for the Big Wheeled Ballyhoo for a short period recently. This place is amazing. Okay, let’s imagine for a minute that Nebraska is something other than what most folks think. (In other words, not flat!) Yeah, yeah, I know. You don’t believe it. Nebraska is boring. Well, if you think so after this post, you’re just being stubborn! Check this out………. 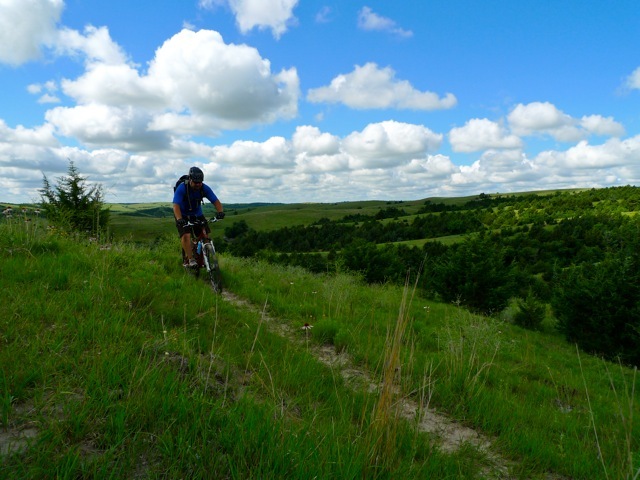 Western Nebraska is “Big Country” in a good way! One thing that most folks don’t realize is that the “interstate”, (I-80), is built to use the path of least resistance through Nebraska, just like the railways used, and the wagon trains before that: Right along the Platte River valley. (“Platte” means “flat” in French) Get away from the Platte valley, and you’ll find a much different Nebraska than you ever thought of. Down hills are tough, steep, and fast at Potter’s Pasture. That’s what we have found at Potter’s Pasture, an amazing landscape that is at once beautiful and surprising in its unique makeup. Potter’s Pasture is just what the name implies: a grazing land for cattle which roam freely about the approximately 1600 acres of ground here. The cattle do a unique and cool thing to the land. they make “cow paths”, yes, but because of the nature of the soil, these paths evolve into ruts in many places. These can swallow a rider whole in spots. Kind of like riding in narrow trenches, only at really steep angles! 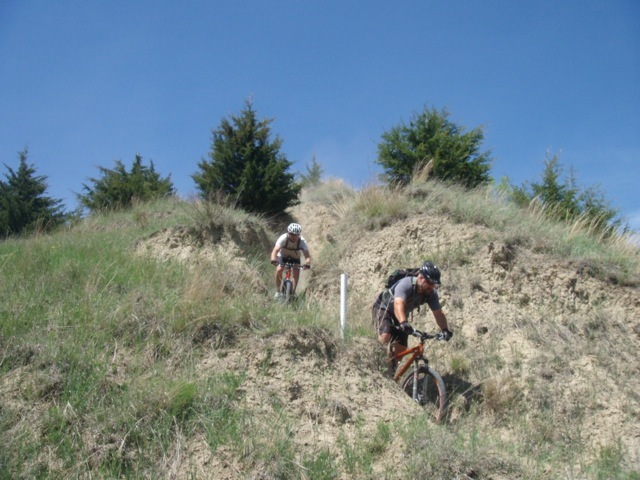 The cows create challenging trails that make riding a ton of fun out here. The nature of the cow’s trails are such that you have barely enough room to keep your pedals, handle bars, and at times, your shoulders from contacting the trail. 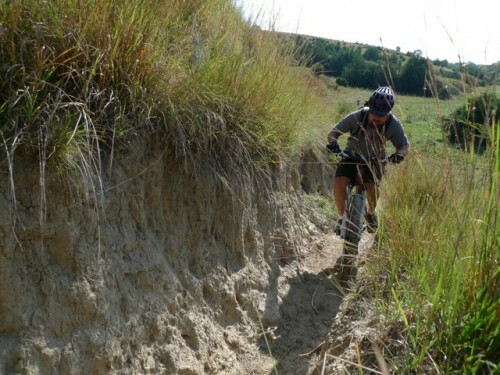 It is like a 3D single track: At once narrow in a lateral plane and a vertical one. But that isn’t the whole story here. Not by a long shot. Climbs are long, gradual, steep, and you are definitely going to need a granny ring here. Many times there are step ups created by roots, and technical moves are called for quite often. The down hills range from fast, wide open, rippin’ types to switch backed, slow speed, tree lined, and exposed. The way a trail you are on changes is fun in this way, because one downhill can have all the aforementioned traits in one run! Negotiating some rooty step downs. The soil is a “loess” type. Very silty, fine, and tires get a great bite in it. 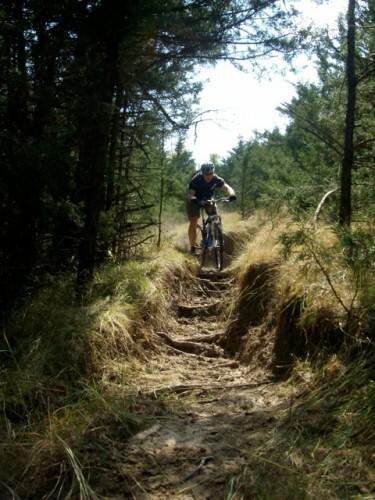 Knobby tires with good traction are recommended here. 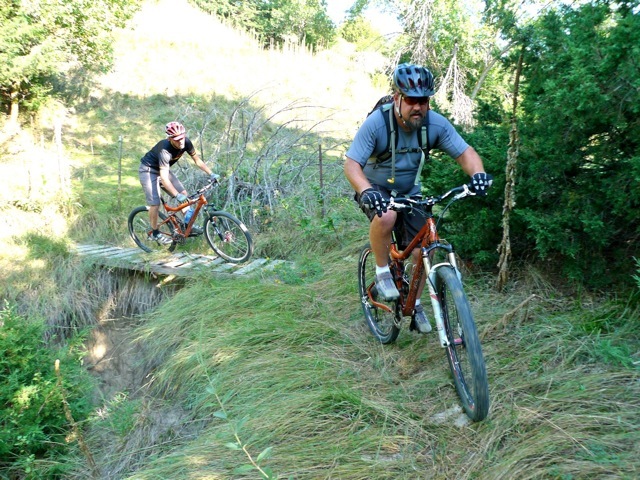 I also found that a dual suspension rig was really the ticket to ride, but we had fellows on hard tails on our ride that were having a blast, and even single speed rigs have a place at Potter’s. I chose a Big Mama, which I have reviewed for this site. There were also two other Big Mama bikes on this ride as well. All were set up differently, but this bike was a perfect platform to base a ride of Potter’s Pasture on. Chad and MG piloting there Big Mama rigs through some Potter’s pasture goodness. The full suspension 29″er rig is tailor made for Potter’s Pasture with its rooty, step down, and technical descents. The way the Big Mama handles this is awesome and climbing is where I thought the Big Mama was really tops here. The traction necessary to step up over roots, and dig in on the steepest sections was quite evident. I think lots of rigs are capable at down hill runs, but the nimble handling and climbing abilities of the Big Mama were really the thing that impressed me. All three of us cleaned really tough climbs and we were told afterward that we were “walking away” from the other bikes being ridden in the group on the ups. Pretty impressive. In my opinion, I have always thought Salsa Cycles philosophy on the Big Mama was a perfect fit for a remote, back country type ride. Potter’s Pasture bore that out for me in spades. It is a reliable, fun, capable handling rig that I never thought was holding me back. 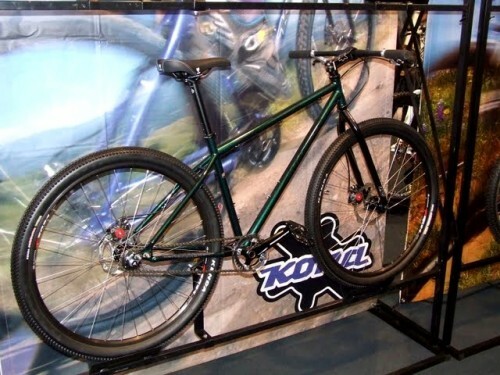 Even set up with the 120mm travel Reba Team fork, which jacks the bottom bracket height far beyond what Salsa designers intended, this bicycle was really sharp. Maybe a tad bit tippy in a couple of really tight switchbacks, but doable all the same. In the 100mm setting, the bike would definitely be even better, and my riding companions bore that out for me. 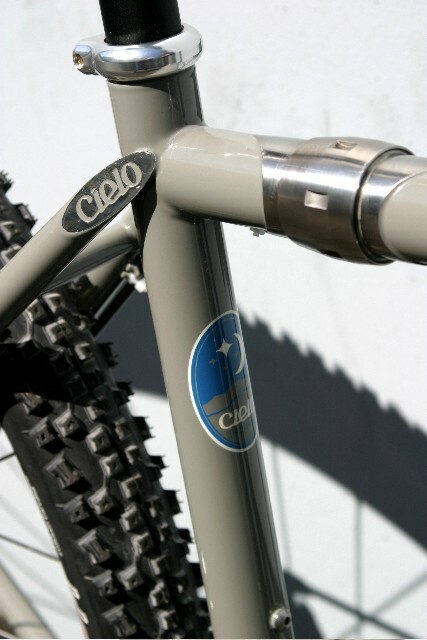 (Both having 100mm travel forks on their Big Mamas). 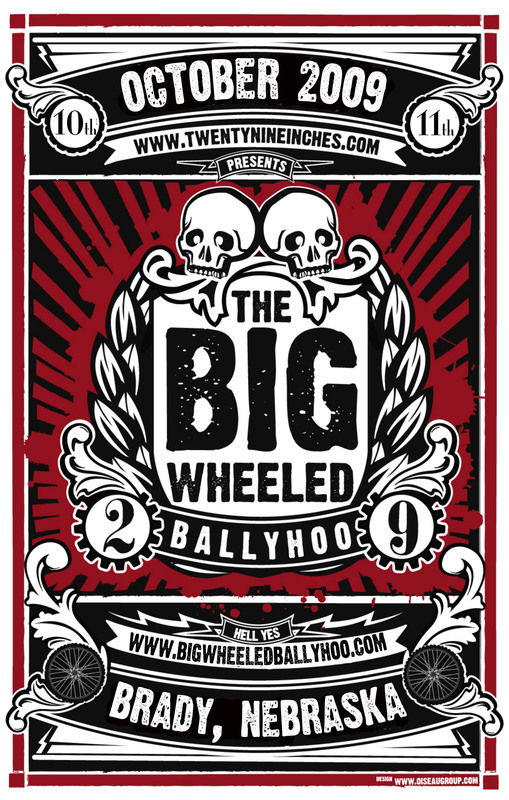 So, that’s the report on the site of the 2009 Big Wheeled Ballyhoo and a bit of a Big Mama update. Check out the event if you can, or if you are ever in the area, it is worth a side trip to Potter’s Pasture to taste the “big country” of western Nebraska.